Browse a magazine / Get lost in a good story / Listen to music / Watch a movie? At different times throughout the year, our librarians participate in public events where we promote library materials and services. During two recent afternoons, we were at the Leddy Library at the University of Windsor. 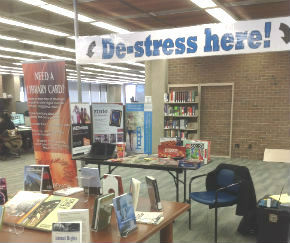 It is exam time at the university and their library workers are encouraging students to take a break from studying to de-stress. We wanted to tell students that with a public library card and a tablet, smart phone or personal computer they could download an ebook or e-audiobook from OverDrive, watch movies or listen to music from Hoopla, or enjoy the pictures and articles in a e-magazine delivered by Zinio – all without leaving campus.